You’re busy! Don’t waste time standing in line! LehmanQ will tell you when it’s your turn! Use our new mobile scheduling tool, LehmanQ, to check in - from anywhere - to the Lehman IT Help Desk in Carman Hall. Use your mobile phone, your computer, or the kiosk at Carman Hall. More offices are coming soon! 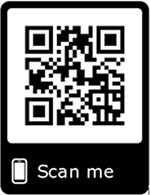 Click on the URL https://tinyurl.com/lehmanq (or scan the QR code below). Follow the directions to sign in. You will receive text updates on your cell phone. Bookmark the site for future use! Go to the kiosk outside the Carman IT Center. Touch the iPad screen to begin. L (Leave the queue) - use this command when you need to exit the line. S (Status update) -use this command when you want an update of your wait time and place in line. M (More time) -use this command to request additional time if you can't be in the area. H (Help) - use this command to get additional assistance with LehmanQ. W (Switch) - use this command to switch from text to voice call updates. N# (Notify me in # minutes) - use this command to let LehmanQ know when to send an alert.